Acknowledging the fact that participants have a wide range of professional backgrounds, core modules aim at providing the student with a general overview of different disciplines relevant to natural resources. The REM program follows the principle of sustainable development, which can only be achieved in consideration of ethical and social aspects. Therefore, such aspects play a fundamental role during the studies. In various courses students are encouraged to think and reflect critically. 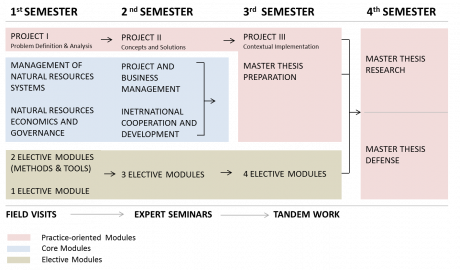 The elective modules are organized into “Methods and Tools” and three thematic blocks: “Integrated Water Resources Management IWRM”, “Natural Resources Management and Development NRM” and “Renewable Energy Management REM”. Students select a total of ten elective modules from the respective module catalogue REM (minimum 25 ECTS), the module catalogue Methods and Tools (minimum of 10 ECTS), and a maximum of 15 ECTS modules from the two module catalogues of the adjoining master programs (NRM and IWRM).